When your scan is complete, a report is generated that provides you and your healthcare provider with helpful information that was obtained. This report may provide insights that will prompt a closer look at specific organs and body systems, and explore your biological preference for medicine, nutritional supplements, and treatments you could benefit from. Biological preference simply means those stimuli your body responds most favorably to. Using this information, you and your healthcare provider can decide on a clinical strategy developed specifically for you, based on your body's responses. Does your body know what it needs? Maybe you just need to ask! What do you need to enjoy better health or to stay healthy? Many people choose to take nutritional supplements, but guess as to what supplement will work best. Even though a supplement may work for someone else, how do you know it's providing the support you need at the present time? 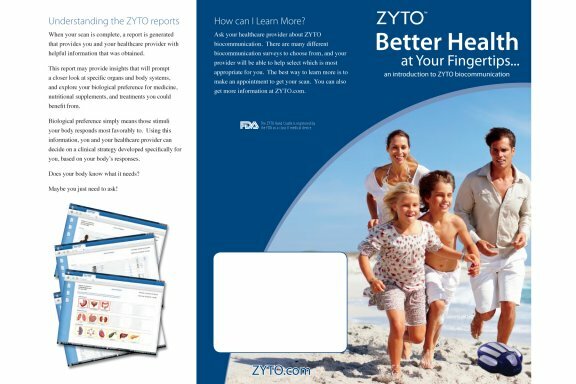 To make better decisions about these and other health choices you should consider ZYTO biocommunication. Biocommunication is an exchange of information between a computer and your body; it's like the computer is asking questions and your body is answering them. Here's how it works: ZYTO technology sends your body an energetic pulse or signature called a Virtual Stimulus Item (VSI). VSIs are representative of physical items including nutritional supplements, drugs, body functions, and organs. As each VSI is sent, your body's response is measured and recorded. The way your body responds is energetic; it's called galvanic skin response or GSR. ZYTO measures complex GSR patterns and determines shifts in your energetic posture. These shifts, either negative or positive, identify what are called your biological preferences. This information is used to make better decisions about your health.